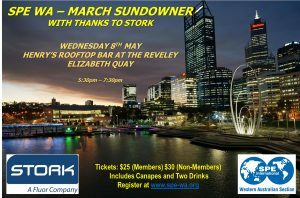 SPE WA, with thanks to our sponsor, Stork, would like to invite you to our May Sundowner. Come and enjoy a drink and canapes while taking in the views from Henry's Rooftop Bar at The Reveley, Elizabeth Quay. Date: Wednesday 8th May Time: 5:30pm - 7:30pm Tickets: $25 for Members. $30 for Non-Members (includes Canapes and two complementary drinks) Looking forward to seeing you all there!